Axiomtek, one of the world’s leading designers and manufacturers of innovative, high performance and reliable PC-based industrial computer products, has announced the arrival of the eBOX560-880-FL, a palm-sized, fanless embedded computing system utilizing high-performance Intel® Haswell ULT multi-core SoC. The ultra-compact, ultra-lightweight eBOX560-880-FL adopts an IP40-rated rugged aluminum cold-rolled steel enclosure to withstand vibration of up to 3Grm (with SSD) and has a unique thermal solution to support the temperature range from -20°C to 50°C (-4°F to 122°F). Supporting 4K2K resolution via HDMI interface, the outstanding embedded box computer is ideal for passenger information system, Kiosk, entry-level gaming, video surveillance, as well as other automation and embedded applications. Axiomtek eBOX560-880-FL offers a choice of new 4th Generation Intel® Celeron® 2980U or Intel® Core™ i5 4300U SoC onboard processor, featuring lower power consumption and expanded list of useful features. 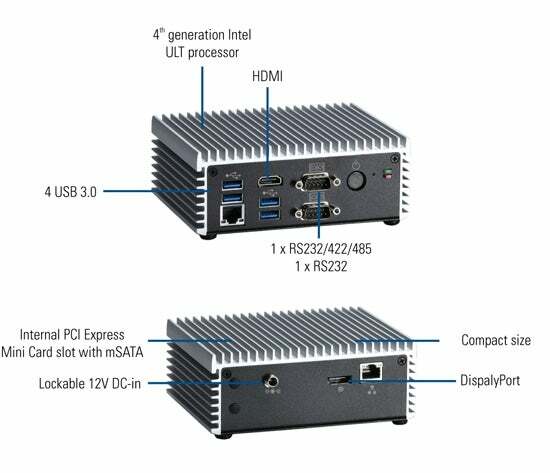 This embedded box PC offers one 204-pin DDR3L-1600 SO-DIMM system memory supporting up to 8GB, advanced 3D Intel HD Graphics capability without requiring the use of discrete graphics card and Intel® platform protection technology (execute disable bit) that can reduce exposure to viruses and malicious-code attacks and prevent harmful software from executing and propagating on the server or network. "The eBOX560-880-FL is a super compact embedded box computer measuring only 141.5mm x 106mm x 55 mm (5.57in x 4.17in x 2.16in), making this system a great choice for space-constraint environments," said Vincent Ji, product manager of product and marketing division at Axiomtek. "It is designed with rich industrial grade features to meet the demands of rugged operations. Its wide operating temperature range is unique for an embedded box of such size. In addition, the unique fanless design requires zero fan maintenance and offers dust-free and noiseless operation." The eBOX560-880-FL has one internal PCI Express Mini Card slot (USB + PCIe signal). The storage interfaces include a 2.5in SATA HDD and one mSATA slot. This turnkey embedded platform allows systems integrator and users to launch their application faster and enhances time-to-market, saving equipment deployment time and cost. The feature-rich and flexible eBOX560-880-FL offers two independent displays: DisplayPort and HDMI. To fill different application needs, the fanless box system reserves a wide choice of I/O ports including two COM ports (one RS-232/422/485 port and one RS-232 port), four USB 3.0 ports, and dual Gigabit Ethernet ports. It also supports VESA mount, wall mount, DIN-rail mount (optional) which can be used for different panels and display applications. The built-in Watchdog Timer can automatically and remotely reset the system after a crash or system error. The product has CE certification and full power protection with OVP (over-voltage protection), OCP (over-current protection) and SCP (short circuit protection). For more information, please contact Axiomtek.